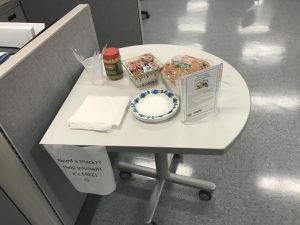 came up with this wonderful idea of PBJ stations. Hruska says “The idea is for students to have something to eat at no cost, and so that they don’t starve while on campus.” These stations are found at different sites around the school. STEM centers will have them and even the Valley Works site has one already up. Hruska contacted Fantini Bread, and the company Teddy peanut butter. These companies have agreed to donate some supplies. “We even have nut free spread, and gluten free bread for those who need it.” Hruska says. Students all over campus both Lawrence and Haverhill will have access to these stations “Makes me feel like they care. It’s very thoughtful.” Said Janilka Gonzalez an EMT student at Northern Essex. Gonzalez stated that not many people think of college students and their pockets. Janiliz Gonzalez, a human service major here at northern essex says, she had no idea about the project. “They understand the struggle. I starve all the time.” Said Gonzalez in a humorous manner. After hearing about it she believes students will benefit greatly from free peanut butter jelly sandwiches. They are even providing baggies so students can take some to go. Northern Essex has made it known that they want to take care of their students.